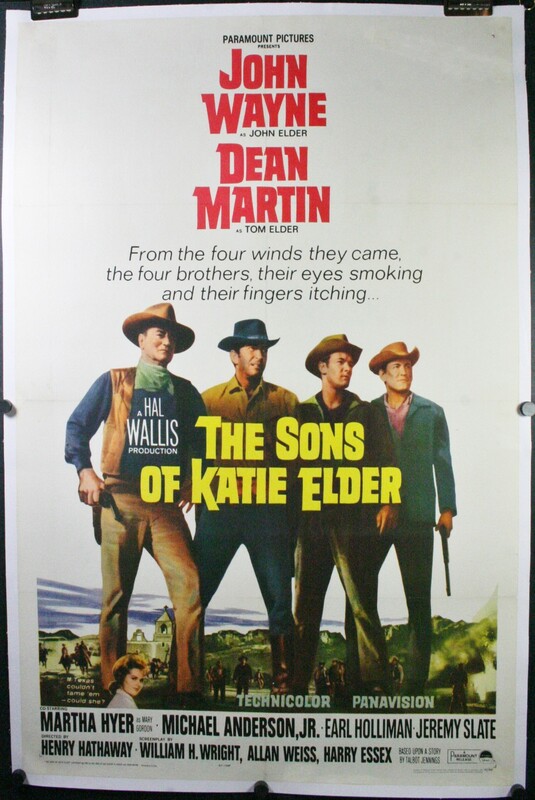 THE SONS OF KATIE ELDER, 1965. Original One Sheet (27 x 41”), (89 x 125 cm) originally folded and now linen backed movie poster starring John Wayne, Dean Martin and Martha Hyer. Directed by Henry Hathaway. Produced by Paul Nathan and Hal B. Wallis. Based on a story by Talbot Jennings. “From the four winds they came, the four brothers, their eyes smoking and their fingers itching…” The four son’s of Katie Elder are determined to avenge their father’s murder and the defrauding of their mother. Filming was due to begin in September 1964, but had to be delayed until January 1965, after Wayne was diagnosed with lung cancer. Even after having a cancerous lung and two ribs removed, Wayne insisted on performing his own stunts, and nearly contracted pneumonia after being dragged into a river. This poster is in fair C6 originally folded, and now linen backed condition. The colors are great and the fold lines are still faintly visible. Some retouching has been done along the edges of the poster. Some tears along the fold line have been repaired. To see this poster and others visit our gallery the Limited Edition in Historic downtown Katy, Texas. Providing poster sales, Linen Backing, Restoration and Framing services to the Houston, San Antonio, Austin and Dallas Areas.